Platinum Educational Group | The testing, scheduling, skills tracking and reporting experts! The Testing, Scheduling & Skills Tracking Experts! 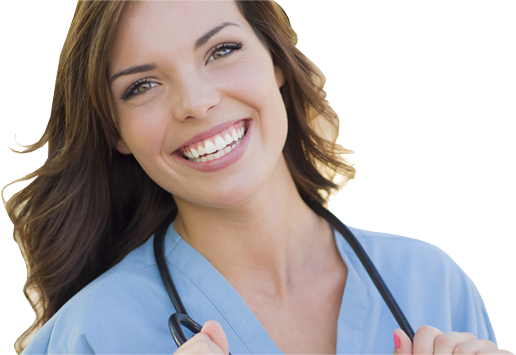 Our online testing, scheduling, skills tracking & reporting software is designed for schools, instructors & students in EMS, Nursing & Allied Health professions. 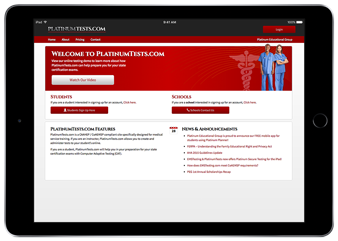 Platinum Tests is an online, mobile friendly computer adaptive testing program that delivers content to help nursing students prepare for their NCLEX-RN® certifications. Platinum Educational Group is proud to announce our FREE mobile app (with all the features of the full website) for students using Platinum Planner! EMSTesting is the only online computer adaptive testing program that delivers content that is constructed to help students prepare for their EMR, EMT, AEMT, & Paramedic certifications. 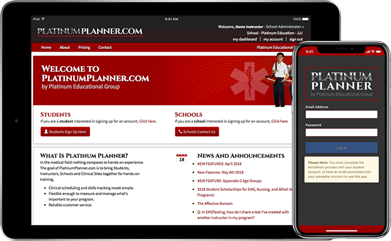 Platinum Planner is the only program of its kind that delivers online scheduling, skill tracking and reporting specifically designed for EMS & Allied Health Professions!